What is google merchant center promotions? Google Merchant Center (GMC) Promotions is a free feature that lets you add promotions on your Google Shopping ads. Your ad will show a “Special Offer” link under your ad details such as free shipping or 20% off. They can create urgency in shoppers by showing when the promotion expires. The promotion will also appear inside the product listing ad (PLA). What Kind of Promotions Can You Use on GMC Promotions? You can combine promotions that might not be allowed on their own. What Countries Is GMC Promotions Available In? Before you can begin using Google Merchant Center Promotions you have to have an active product(s) feed and an AdWords account. Fill out the Merchant Promotions Interest Form (it’s only seven basic account questions). You should hear back from Google in 24 hours to one week. When you are approved you will see a link called “Promotions” appear on the left menu bar in your GMC account. Google has an approval process to join the Promotions program that can take 24 hours to one week. Additionally, there is an approval process for each promotion that can take 24 hours to three days. Plan ahead! Your first step in promotion design is to think about the reason for your promotion. Make sure you’re adding value for Google shoppers. Google has certain rules (yes you know this already don’t you) regarding their promotions including Program Policies and Editorial Requirements. Promotions must provide a monetary discount or an additional good or service not normally associated with the purchase. All promotions are applied at checkout or point of sale. Review the Shopping AD Policies to remind yourself of the Google Rules. In a nut-shell: no counterfeit, dangerous products, dishonest behavior, inappropriate content, misrepresentation of self or product. Don’t trick or mislead shoppers. See Title Requirements below. Make sure your promotion doesn’t ask for additional user requirements like signing up for a credit card, paid membership or survey participation in order to redeem the promotion. Promotions must be available for all shoppers. Don’t segment (ex. teachers, students, seniors, military, on-your-birthday, first time customers. Don’t restrict your promotion in other ways (ex. discount with social media like, discount with certain credit card, discount with survey participation). If your promotion is for specific products, those products must be identified in your product feed(s). If your promotion is for a bundle, you have to clearly state which products (and ALL of the products) must be included to quality. A shopper’s receipt of promotions must be clearly confirmed by the point of purchase, and given in the cart or at checkout (NOT on the product landing page). Do not put the promotion on your landing page(s). The way Google sees it, it’s not an added value promotion if it’s already on your landing page. Do not update your product feed(s) with the promotion price. Free items (ex. gifts, gift cards, e-cards) can be displayed on your landing page, and must ALSO be in the cart/basket or on the checkout page. You must include a valid redemption code for a shipping promotion. Make sure the items tied to the promotion are at the item price threshold. For example, if you’re offering free shipping for items over $50, don’t include the shipping promotion code in your product feed(s) for items under a price of $50. For example, if free shipping is already given for orders $45+ (without code) and you would like for free shipping to be given at $35+ with code, the promotion should only be mapped to items that are priced below $45. If a promotion requires a minimum purchase, it must be stated in the title (e.g., $5 off purchases over $20). If a promotion is good for certain items or types of items, don't create a misleading title that implies otherwise. If a promotion includes tiered discounts, promotions should never show the highest possible value (e.g. the "ceiling"). Tiered promotions can be submitted as one promotion or multiple. If you submit a tiered promotion as a single promotion, the title must be within the 60-character limit and state the “floor” promotion. Example: 30% off organic household products (maximum discount $20). Check your capitalization – don’t use all capital letters, you can capitalize the first letter of every word in the offer title if you are consistent. Identify the product items you will be associating with your promotion. Either ALL items or a subset of items. You will need to add a field called promotion_id and assign the Promo ID to all the items for your specific product promotion. More on this in the section Google Merchant Center Promotions Setup below. Use the tips above to design or review your promotions before setting up GMC Promotions. Option 1 – The Promotion Tool - Use this option if you have a limited number of promotions you want to run. Option 2 – The Promotions Feed - Use this option if you have a large number of promotions you want to run (this will save you a lot of time), or if you want to use additional fields like promotion display dates, minimum purchase amount and generic redemption code. TIP: There is no way to create the promotion itself only within your inventory products feed. Submitting any promotion information (other than the promotion_id) within the product-feed is a policy violation and is grounds for disapproval or account suspension. TIP: Give yourself at least five days before the actual start of your promotion on your website. This will give you time to troubleshoot and resubmit if necessary. TIP: Make sure you promotion runs as expected as mentioned in your promotion, check redemption at checkout and make sure the product’s promotion price is NOT on your landing page. TIP: Add a product group on AdWords for promotion eligible products. You can view a detailed report on the performance of your promotion, and you are able to start/stop showing the products on your website. TIP: Segment your shopping campaigns by click type. The “Shopping-Product-Coupon” click type will tell you the number of impressions you received from the “Special Offer” link. If you only have a few promotions, use the GMC Promotion Tool in GMC. Have access to your GMC ID, logo (or the URL), and your promotion details on hand. Click on the Promotion Link on the left menu bar, then click on “Create New Promotions Feed” button to create a promotion. Fill out the offer terms, short and long title, dates of the promotion and the coupon code (if you’re using a coupon). See descriptions and tips below. TIP: If you are going to create a promotion for specific products (as opposed to ALL products) take note of the Promo ID you enter. You will need to add this Promo ID to the specific products in your feed. This is what your shoppers will see when they they click on the “Special Offer” link to find out more about your promotion. You have only 60 characters so make them count! See the Title Guidelines and Title Formatting sections of this guide. The text code customers can use online (ex. EXTRA20). Remember: ALL shipping promotions must include a valid redemption code. While a redemption code is optional, it is often recommended. Double check this code before saving your promotion online to make absolutely certain it matches the actual sale code exactly. All Products - no changes required to your Products Feed. Specific Products - you MUST add a column for promotion_id to identify which specific products to apply the promotion to. If you don’t update your Products Feed with this information your promotion will be rejected. Add the promotion start and date times. Adjust the time and time zone as needed. Your promotion MUST be active on your website BEFORE Google validates and tests, otherwise your promotion will not be approved. Once your promotion start date and time are met, THEN Google will start the SKU approval process. It can take one to two hours to get approval on the promotion. If the promotion start date and time are not IDENTICAL to the start date and time on your website, Google’s robots will go check your site and see it’s not live yet, and the promotion will be rejected. Make sure everything you’ve entered is accurate. Go to the Promotions page in GMC and click “List. The status of each promotion will be listed. If you see a “Rejected” status on your promotion, click the bubble on the far right to get more information on why the promotion was rejected. 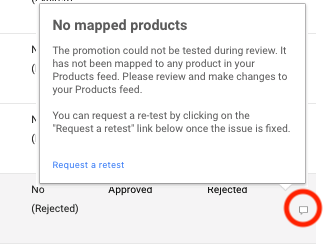 If your promotion was rejected, fix the errors as requested by Google, then click on the Request a retest blue link in the bubble message. This guide will explain how to use a spreadsheet as a Promotion Feed. Create a spreadsheet with the following attributes (See the Feed Template in Google Sheets). If submitting multiple promotion_id value for an item, submit the values separated by commas; you can include up to 10. TIP: When using multiple promotion_id, the order the promotions appear are set by the order they appear in the Product_applicability field: SPECIFIC_PRODUCTS are prioritized before ALL_PRODUCTS. TIP: Google.com will only show one promotion. TIP: If you’re using SPECIFIC_PRODUCTS and your products feed does not have the promotion_id field mapped, your promotion will be rejected. TIP: If you’re using SPECIFIC_PRODUCTS you should NOT submit a NEW product feed, simply edit the current produts feed to add the new promotion_id attribute with specific values. TIP: if the promotion is for all products, you do not need to add promotion_id. If you use GENERIC_CODE you must include optional field generic_redemption_code with the text code customers can use online (ex. EXTRA20). ALL shipping promotions must include a valid redemption code. Follow the Editorial Guidelines in the Google Merchant Center Promotion Design portion of this guide. promotion_display_dates If you want to specify the date and time when the promotion is to go live on Google.com and in Shopping Ads use this optional attribute. This gives you the option to let Google review your promotion in advance of the effective date (Remember: you need to have the promotion IDs mapped in your product feed at the time of review by Google. Otherwise the “live” date and time will be the promotion_effective_dates. TIP: make sure your promotion is live on your website BEFORE the promotion_effective_dates start date/time or promotion_display_dates start date/time or Google will not approve your promotion. minimum_purchase_amount Describe the minimum amount of purchase that must be made for the offer to apply. generic_redemption_code The text code customers use online to activate the promotion in thier shopping cart (ex. EXTRA20). REMEMBER: Add the the promotion_id attribute to your Products Feed to map the products to the product specific promotions! The final step is to upload your Promotions Feed to GMC. Follow the steps outlined by Google in Step 4: Register and Upload Your Feed. You can only edit a promotion that hasn’t already been approved. Be careful when filling out the GMC Promotion Tool. If you submit a promotion and it gets approved and you have a change you want to make, the only thing you can do is to stop the promotion and create another one (and have to wait for Google approval again). If your promotion is approved and is within the promotion_effective_dates, there may be a delay of a few hours before you can see the promo on all products. You may want to get everything set up and approved before the actual promotion start date. Policy Review - usually completed the same day, Google checks for policy and editorial requirements. SKU Review - this only begins once the promotion effective start date is met, hence the several hour delay. Price on your landing page is the promotion price (this is not creating value in Google’s mind), the promotion price needs to appear in the cart or at checkout. 1. Promotion_effective_date attribute is incorrect. See Promotions Feed Specification Article. 2. Your feed template is out of date. See Current Feed Template.